One of the sweetest signs of spring in Wisconsin has to be the sight of buckets or bags attached to towering maple trees, placed to catch the sap that will be turned into tasty golden maple syrup. 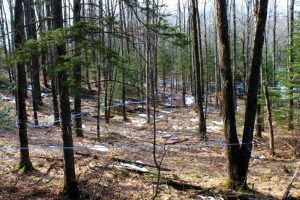 By this time of year, the bulk of the work is done at those tree-tapping sites—now’s it’s time to celebrate and enjoy the fruits of maple-syrup labor. A great place to celebrate is Maple Fest in Medford, a full day of family-friendly activities held at the end of April in the heart of some prime sugar-maple land in Taylor County. 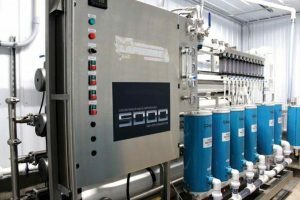 Taylor Electric Cooperative members Dave and Shirley Lemke recently installed a modern sugar shack with a reverse osmosis syrup-making operation. 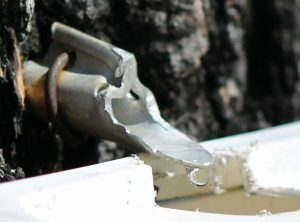 This is a more concentrated method of removing water from the sap, cutting down the cooking time. Lemke is also a maple-syrup producer himself. He’s been tapping trees at various times for most of his life; currently he taps at six different sites within the Chequamegon National Forest. 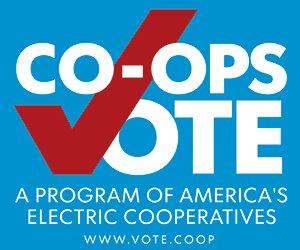 Just this year he added a new, modern sugar shack that’s fully energized thanks to Taylor Electric Cooperative. Lemke added that maple-syrup production is increasing throughout the entire state. According to the Wisconsin Department of Agriculture, Trade, and Consumer Protection, Wisconsin ranks fourth in the nation in maple-syrup production, behind Vermont, New York, and Maine. Lemke attributes some of this growth to “people getting more interested in what they can get out of their own woods.” Taylor County, which encompasses part of the national forest, is blessed with woods, no doubt helping to fuel the growing interest here. At Maple Fest, held this year April 29 at the Taylor County Fairgrounds, guests will be able to sample some of the area’s prized syrup, as the day kicks off with a hearty pancake breakfast. Later, entries in the Maple Syrup Contest will be judged by experts who evaluate the samples for clarity, color, density, and flavor. 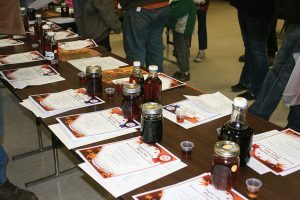 Although most of these entries are from local producers, the contest is open; anyone can enter a jar of homemade syrup and see how it measures up. Plastic tubing links the maple trees at one of the collection sites of Taylor Electric members Dave and Shirley Lemke. Small drop lines link the taps on the trees with the main line. Maple Fest is also a great opportunity for those who might be interested in tapping their own trees to learn all they need to know. Local producers will be available to answer any questions and share experiences. Many even offer tours of their cooking sites in the woods after the day’s festivities wind down. Without question, maple syrup is the star of this celebration, but Maple Fest isn’t just about syrup. This event is unique among other maple-syrup activities held throughout the state each spring in that it’s a celebration of the sugar maple trees that grow in abundance here. The first 500 guests are even given a free maple tree seedling, courtesy of the county land conservation office. 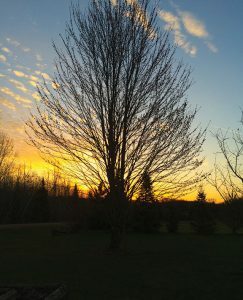 Designated the state tree of Wisconsin in 1949, the sugar maple is one of the largest of hardwood trees and, as Lemke pointed out, it offers much more than sap. The wood is valued for making furniture, cabinets, flooring, sports courts, and even guitars. Therefore, Maple Fest events include maple chainsaw sculpting demonstrations during the day, plus displays of products made from maple trees. “We ask all our vendors to specify what they have that’s made from maple trees, like woodworking products or different products made from sap,” Lemke said. 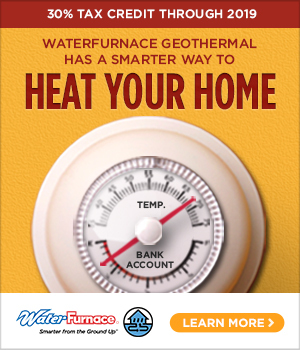 The day includes plenty of educational opportunities as well. County conservation officials will be on hand to discuss best conservation practices with maple-syrup hobbyists. A demonstration of early American maple-syrup making will offer a history lesson of the area’s heritage; the Taylor County Historical Museum will be open all day to coincide with this event as well. 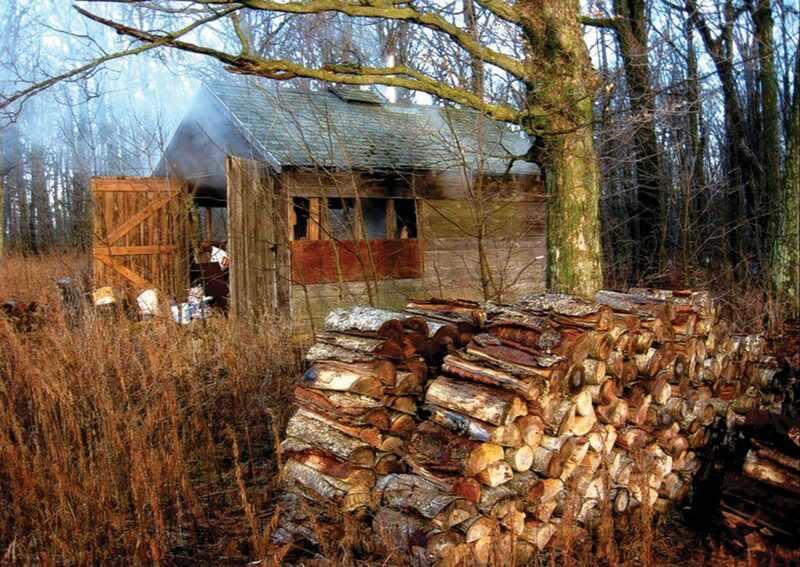 This traditional sugar shack was captured in a picture that took best in show in a past Maple Fest photo contest. Other maple-themed activities are strictly for fun: Shutterbugs can enter pictures of the state tree, its byproducts, or maple-syrup making in the maple-themed photo contest. Area grade school classes and youth organizations can enter a red wagon float designed with the theme “Wisconsin’s Maple Magic” for the Red Wagon Parade, and all children can participate in a maple scavenger hunt held throughout the day. This year’s Maple Fest will also feature an antique and collectible appraisal event, featuring author and antiques expert Mark F. Moran of Iola. There will be live music and food all day. Maple Fest, now in its fifth year, is also unique in that it is a countywide event co-sponsored by six different Lions and Lioness Clubs in the area that work together to plan and run the day’s activities. The idea for Maple Fest was conceived five years ago, when Lemke was serving on the county board as head of a recreation and tourism committee that was looking for new ways to promote the area. An event focused on Taylor County’s growing maple-syrup industry seemed a natural choice. The event has grown steadily, with new activities added each year. And that’s what maple-syrup making does. 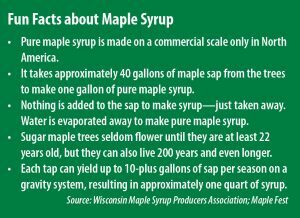 While Maple Fest celebrates all the tangible benefits of the maple tree, it also captures the intangible value of making maple syrup. Maple Fest will be held at the Taylor County Fairgrounds, Hwy. 13 and 64, Medford, Saturday, April 29, from 7 a.m. to about 4 p.m. For more information, visit taylorcountylionsmaplefest.org or call 715-785-7573 or 715-447-8783.